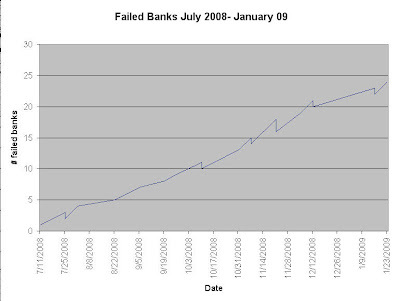 Back in July 2008 it was a big shock to hear of banks going bankrupt. Since then, many more banks have been added the the FDIC failed bank list. You will notice many of the failed banks were in HOT real estate States like CA, FL, and many from GA.
Hey HPT how are things doing lately? You should post update at least monthly how's your trading and all for us old followers and readers of your blog. I know that you are now more in other things online, but I don't follow that so I miss it. I'm doing well FX. Trading Ym and NQ mainly. I don't have my ATS done yet, but I'm hoping I can get more time to work on it soon. I went live on the ATS last week for a few trades and I did alright. I've been really busy. I still host an online trading room and the community is growing, some pretty good traders. Hope all is well with you. It nice to keep in contact with fellow bloggers. I haven't done any P/L type posts or posts about me for months now, I'm trying to just post stuff that will help other traders out.